Welcome to the Accordion-O-Rama website. We really are the accordion pros and specialize in ACCORDION SALES, SELECTION & SERVICE. Accordion-O-Rama has a tremendous selection of hundreds of new and re-conditioned accordions. Accordion-O-Rama is family owned and run. Since 1950, we have stocked an extensive inventory of new and rebuilt accordions and concertinas. All are sold at discount prices. Accordion-O-Rama is an authorized dealer and factory-service center and can customize your instrument to meet your requirements-including MIDI. In many cases, we are a direct importer and can offer you the best value for your money since there is no middleman. It is hard to publish prices, since prices change with the fluctuations in the exchange rate. Since we are a direct importer, we pass on the current best value to our customers so call or E-mail us for current prices. Piano accordions, diatonic accordions, chromatic accordions, button accordions, electronic accordions, MIDI accordions, bassetti accordions, free-bass accordions, concertinas, and bandoneons are offered here at considerable savings. Accordion-O-Rama typically has selections from the following makers: Arpeggio, Avanti, Cordovox, Crumar, Dallape, Elka, Excelsior, Farfisa, Ferrari, Gabbanelli, Galanti, Guerrini, Hohner, Orla, Paolo Soprani, Polytone, Roland, Sano, Scandalli, Solton, Sonola, Vox, and other firms. We carry accordion microphones, synthesizers, accordion amplifiers, speakers, organ-accordions, and generators . Accessories such as music books, accordion stands, dust covers, accordion straps, accordion cases, tapes, and even Accordion-O-Rama T-shirts are offered. Separate specialists for tuning, mechanical repair, and electronic accordion repair are all under one roof. We often accept some of the worlds finest instruments on trade from our customers and buy used accordions that are worthy of rebuilding. You can buy a WORLD FAMOUS TOP OF THE LINE instrument at a fraction of the cost of a new one if you purchase an expertly rebuilt one. Our expert sales staff is glad to co-operate with you to help you understand what you are buying whether it is new or rebuilt. We rent accordions for any length of time and can rent with an option to buy. 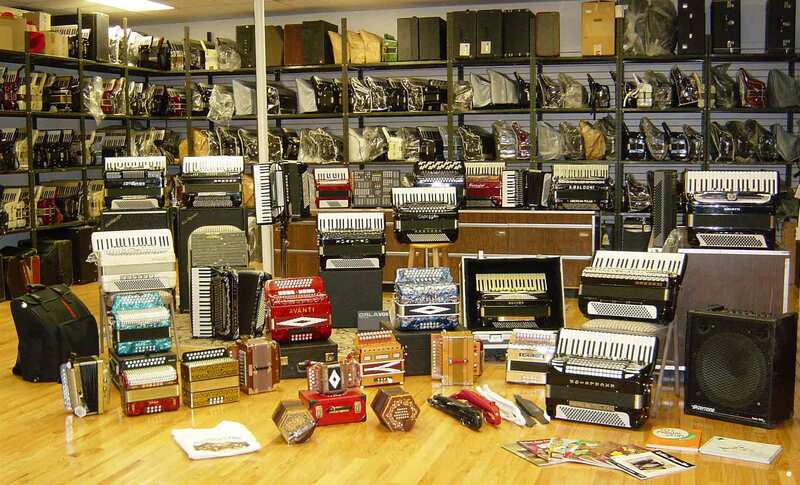 Accordion-O-Rama is your one stop shopping place for all your accordion needs. Our knowledgeable sales staff can match you to the accordion that is right for you. When speaking, writing or E-mailing our staff, be sure to be specific about your likes and dislikes so that they may recommend the accordion that is right for you. You may want to read about a few of our accordions now or go right to our accordion questionnaire to select your preferences. We really are the accordion pros and specialize in ACCORDION SALES, SELECTION & SERVICE. Need help on Accordion terms click here or click on the icons below to go to our other pages.